On August 21, 2017 at a memorial complex of Soviet and Mongolian soldiers in Zhangbei County, Hebei Province a memorial ceremony was held to mark the 72nd anniversary of the liberation of the cities of Zhangjiakou and Zhangbei from the Japanese aggressors. The heads of the diplomatic missions of the CIS countries and Mongolia accredited to the People's Republic of China laid wreaths at the memorial to the fallen heroes. From the Chinese side Liu Bin, Deputy Director of the Department of Europe and Central Asia of the Ministry of Foreign Affairs, Li Hong deputy head of the Zhangjiakou City District, and Tian Liulu, deputy head of the Zhangbei County participated in the event. 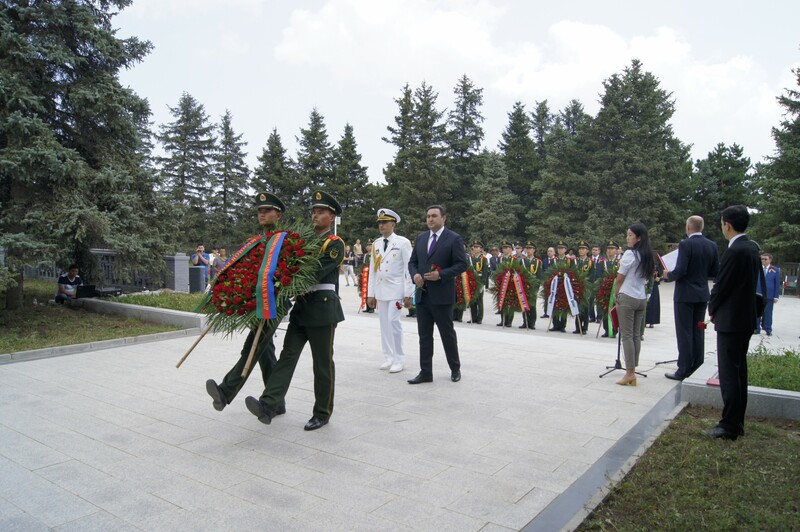 On the Azerbaijani side, Akram Zeynalli, Ambassador Extraordinary and Plenipotentiary of the Republic of Azerbaijan to the People's Republic of China, and Military Attaché, Captain 2nd Rank Elchin Jafarov, laid wreaths at the memorial to the fallen Soviet and Mongol heroes. The event was also attended by relatives of Soviet servicemen who died in the liberation of Zhangbei County and Zhangjiakou City and buried at the memorial. During the event, participants laid flowers to the mass grave of the fallen Soviet and Mongolian soldiers, visited the exposition of the memorial museum, and left memorable records in the Book of Honored Guests of the memorial museum.